The Schwinn A10 Upright Bike is an affordably priced bike. Especially as you get a console with pre-set programs. It’s not a full set of programs but it does help with challenges and variety. And this helps you with motivation, guidance and on track with your fitness goals. It also comes with a media shelf, water bottle holder and speakers to help make it more enjoyable and convenient. It might lead you to have second thoughts about how the bike can offer all this at the price and still be good value. But does get a reasonable rating from most customers. There does seem to be much to recommend the bike but there are some things that you should be aware of when you buy this bike, that aren’t necessarily apparent at first look. I go through these and more in my review below. First up is a look at how stable the bike is as you workout. You get a good stable platform for your workouts while in your seat as it is designed to be used, Out of the saddle and standing on the pedals it will move around a little but the bike isn’t supposed to be used that way. It is made more for sitting on the seat and pedaling. There’s no shaking or rattling from the bike as you’re exercising to distract or annoy you. It has a reasonable warranty for the price with the frame at 3 years, mechanical and electrical is 1 yea with 60 days for wear items and labor (per supplier website). The seat height can be adjusted to accommodate a range of different heights. According to the product listing it will fit most people, which is probably true but not that helpful if you’re not most people – and are outside that description (whatever that means). The company itself doesn’t like to give too much away in terms of giving guidance but they have said that it will fit people from 5 ft to 6 ft. (Some people at 4 ft 10 ins have used the bike successfully). There is no horizontal adjustment to make allowance for different upper body lengths so for some it can result in being cramped or stretching a little. It has a standard method of adjustment using an adjustment knob with a pull pin and preset holes. These make the adjustment quick so that it doesn’t get in the way of multiple users using the bike. It only takes a few seconds to get it done before you are ready. It does need to be done off the seat. There are 8 levels of resistance that are controlled through the console. You can manually control it by pushing the up/down buttons on the console to set it at the level you want. When using one of the programs the resistance is changed automatically as you move through the workout. The levels go up incrementally from very easy to moderately hard which is fine for many people. But it’s not great for those who are looking for very hard hill climb style workouts, as the top level is more described as slope than a hill. The movement between the levels is smooth and doesn’t suddenly increase or decrease. Although there is resistance at the lowest setting of 1 it is very slight and should suit people who want a very gentle workout to get started. Most people find they can get a good workout with the bike. May find the middle range of resistance is where they can get a workout where they can increase their heart rate and get a sweat on. The bike has a belt drive with a perimeter weighted flywheel inside the shroud at the front of the bike. This operates very quietly and doesn’t require any maintenance. The weighted flywheel helps to keep the pedaling motion smooth all through the levels of resistance so that you don’t get variation in it they may add some impact into it. You do need to concentrate on your stroke at the top levels of the resistance to ensure it doesn’t start to be more of an up down motion than a full 360 degree one that is best for a low impact motion. The shroud keeps the belt and flywheel protected from damage and dust to keep working for longer. it also keeps out of reach from small children and pets to help prevent injury. The standard size pedals with strap are screwed into a 1 piece crank. This should be durable and provide a solid platform to pedal as hard as you want against all levels in your seat without any flexing or breaking. The bike isn’t designed for pedaling standing on the pedals. It is possible to do this but it isn’t recommended and you may find the pedals or cranks snapping from this type of usage over time. If you are looking for of this type of you workout where you can do spinning type workouts or tough hill climbs you are better looking at spin bikes or indoor cycles. For affordable bike here are recommendations for indoor cycles/spin bikes under $200 and for indoor cycles/spin bikes under $500. They don’t have a console with pre-set programs but they are designed and can provide tough workouts, not all of them will be as quiet as they have a chain drive rather than a belt drive. The straps are plastic with holes that fit over a tab on the pedal. These help to keep you foot in place as you pedal. Once adjusted you can just slide your foot in and you are ready to go. The pedals work best with athletic shoes or similar. You won’t be able to swap the pedals with standard fitting bike pedals as they don’t have a standard thread. Seat. The seat is padded and contoured. A few find it okay but that is the exception. Many find it is hard on the sit bones especially if they’re not used to bike seats. It can take a little time to get used to any bike seat if you’re not used to them. It can take a few weeks. But even if you do try this you may still not get the comfort you need. To help with this you can try padded bike shorts or a gel seat cover to give the extra padded needed. If that doesn’t work you can replace the seat. The seat doesn’t have a standard bike fitting so it isn’t straightforward to replace. It can be done. You can take it to a bike shop and they can make the adjustments for you. Or you can buy a universal exercise bike seat adapter which you attach to the pole and then you can fit a standard bike set to the bike. Handlebars. The handlebars are angled upwards to help you find a comfortable hand position for you to allow for different heights. The angle of the handlebars aren’t really designed to be changed to accommodate different users but some people do change them around by unscrewing and changing position and screwing back up but you do need to be sure not crimp or trap the cable for the heart rate sensors. They are covered which helps you get a good comfortable grip and really helps hands get sweaty. Noise. It is a very quiet bike. You can use this at any time and not disturb others including during the night. If you want to exercise while watching TV you can do this without turning up the volume. It also can be used in an apartment and you neighbors won’t know you’re working out. To be doubly sure if you put on a rubber exercise mat then those below won’t hear any small noises or if the bike moves. Cleaning. The bike itself won’t generate dirt. But you do need to clean it down to get the seat and dust from it. The sweat especially can damage the bike because of it being corrosive – which can start the bike to rust and jam up if left on. Also, the floor will have sweat drop on it and the best idea to keep that free from the effects of sweat is to put the bike on a rubber exercise mat. This is a very compact bike needing only an area of 27.5 by 16.5 inches when not in use. It will fit easily in a corner or against a wall and you might even fit it in a closet. It certainly won’t take over a room even if you leave it out and it will be there calling to you to use it – which you may like and help you to use it instead of being on the couch you can be up on the bike as you watch TV. It weighs 54.9 lbs which isn’t too bad for an exercise bike but you don’t have to carry it when you do want to move it. The bike has 2 small wheels at the front of the bike that you can tip the bike on to when you want to move it. This can be done by one person, the wheel support the bike and you just wheel it to where you want to go. They’ll work on most surfaces except soft carpets where you’ll probably find you have to slide the bike rather than roll it. Also if you have wood floors you might want to exercise a little care as the wheels might scratch or dent it. The bike comes to you partly completed with the hardest part of the assembly done. It can be completed within a couple of hours and much quicker by some. The tools needed to complete the job are included. The diagrams and instructions do a reasonable job of explaining what is a straightforward job. It involves attaching the stabilizer bars, pedals, seat post, seat, front post, console, handlebars and water bottle holder. If you still feel it may be more than you want to take on Amazon do offer an assembly service but it does cost extra. The console has 6 pre-set programs and one manual program. It displays your progress through the program you are following, battery charge, time, RPM, distance, results, speed, calories, resistance level and heart rate. The display screen is 5 ins by 3 ins that provides a good size to read your measures. However, the screen isn’t backlit so can be difficult to see then the light conditions aren’t the best. There are 3 sections to the display screen. The top part lets you know the program you are following. The middle section shows the profile of program using a matrix split into column – with each column being a segment of workout. The height of the column indicates the amount of resistance you are pushing against. The flashing column indicates the segment you are on. The lower third of the display is split into 4, The first section shows time elapsed or time left (it counts down if a target has been set). The next section displays time and speed for 6 seconds at a time. The third section shows RPM/calories and switches between them every 6 seconds too. The last section displays Resistance level and heart rate if hand pulse sensors are gripped again switching between them every 6 seconds. At the end of the workout it will display your results. Below this are the buttons for selecting programs, setting targets, adjusting resistance and starting/stopping programs. Getting started on the manual program is quick with you pushing the quick start button and pedaling away. The resistance starts at level 1 and you can change it as you go by pressing the up down buttons. You can’t set any targets the measures just count up. The 6 profile programs are pictured on the console around the display. There are 3 categories of 2 programs each – fun rides, mountains and challenges. You choose the category by pushing the corresponding button on the console. You can set a target time – it starts at 15 minutes and you can adjust that up and down using the up/down buttons. The programs adjust the resistance automatically as you go as a segment of time is completed. If the resistance in any segment is too hard or easy you can change it with the up/down buttons as you go. You choose the speed you want to pedal and there aren’t any suggestions as to speed – you set that yourself. You can’t set up your own custom programs nor are there any heart rate programs to train in a particular zone (these are only available of the Schwinn 130 and Schwinn 170). As with all bikes that have these type of sensors they are temperamental. It is often difficult to get a reliable reading or to get one at all. It works with 4 D batteries, that aren’t included, or you can buy an AC adapter separately. From customer reports the bike goes through the batteries very quickly, so you may well be better off spending extra for adapter. It has an auto on/off function where it starts up when you start to pedal and turns off after 5 minutes so you don’t need to remember to do this – it should help with the batteries. Without power you can’t operate the panel of the resistance. The results of your workouts can’t be uploaded to a fitness account. You’ll have to record them separately if you want to record them and track your progress. It is possible to have kilometers or miles for speed or distance. You don’t put in your own personal data like age, gender, height and weight so the calories as with other measures (except time and heart rate) are estimates. Media Shelf. There is a shelf on the console that you can place your media devices (ipads, tablets, mp3, kindle etc) on so you can watch or listen to them as you exercise. They can be seen easily. However, when you have something on the shelf you can’t see the display or use the buttons so can’t keep an eye on your progress or make changes without removing the device. For me this would annoy me not being able to see progress with a quick glance but some won’t be bothered. And you can always see your results at the end by removing the device. Also, there isn’t anywhere to plug your device into charge it like a USB port. You can fit a small book in the shelf but will need to remove it to turn the pages. Speakers. To use the 2 speakers you plug your device into the console using the supplied media cable. The speakers are only okay, they’re not that loud and you may find you are better off using headphones. The volume and program selection is done on the device itself not using the console. Water bottle holder. There is a holder on the front support. It will take small bottles. It is in easy reach but you’ll need to lean forward to get and probably slow your pedaling to get it and put it back. The bike is rated a 4 or 5 by 77% of customers in their reviews which is a reasonable indication that most like the bike they get. The seat of this bike comes in for a lot of criticism – which is not uncommon for upright exercise bike seats but it does seem this is worse. You can try a gel seat cover or padded bike shorts – replacing the seat can be done but it is not straightforward. They also don’t like the resistance and this is understandable if you are looking for very hard resistance – it just doesn’t get that hard. It would be good if they made that clear in the product listing but like all these bikes in this price range they don’t mention it. For the price you do get a better console, speakers and media not seen on others available around the same price. And it is this you ar paying extra for – the pre-set programs in particular which can help with your workouts and get you started at least. When I checked at Amazon on eligible orders it qualified for Prime and free shipping. 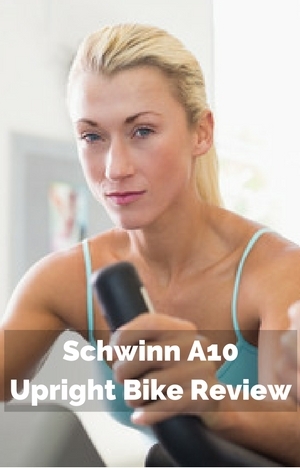 The Schwinn A10 Upright Bike is a good upright exercise bike for beginners and those wanting moderate levels of exercise. It comes with a small selection of pre-set programs which does mean you don’t get overwhelmed by choice but provides you with a variety of challenges. The bike isn’t for anyone who wants very hard hill challenges the resistance is only for those who want slopes rather than steep hills. Nor is it for people who want to do spinning type workouts. Other than those people you’ll get a workout that will challenge them. The seat is likely to be uncomfortable but for most it is solved with a gel seat cover. It’s quiet compact and comes with 6 workout programs to help challenge and motivate. The bike does make a good choice for those that don’t want to spend a fortune on an upright exercise bike or don’t have a lot of room.